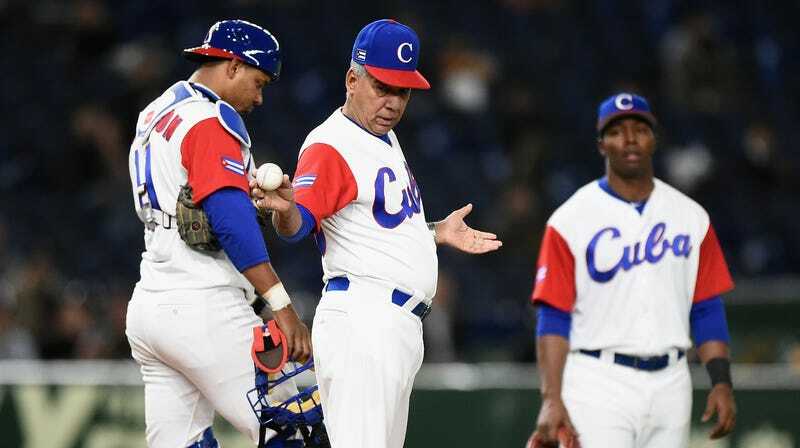 Under the arrangement, Cuban players in the Cuban Baseball Federation (FCB) are broken down into two categories: FCB Professionals, and FCB Amateurs. FCB Professionals are at least 25 years old and have played at least six seasons with FCB, while FCB Amateurs are, basically, everyone else. The arrangement says the FCB must release all FCB Professionals who want to sign with MLB clubs. There are some tedious obstacles, having to do with the usual hassles of ridiculous U.S.-Cuba diplomacy—a State Department spokesperson told The Washington Post that Cuban players will still have to travel to a third country in order to apply for a required U.S. work visa, like all other Cuban nationals. But the deal has some obvious limitations. Yasiel Puig, for example, was 18 years old when he first started trying to defect from Cuba in order to pursue a baseball career stateside, and was 21 years old when he finally pulled it off and signed with the Dodgers in 2012. Aroldis Chapman was punished for a defection attempt when he was 19, and was already pitching in the majors when he was 22 years old. The point is, if you can make millions of dollars to play baseball in the best league in the world as a 20-year-old, being told that you will only be free to sign with a major league team after your 25th birthday is at least a little bit of a bummer. If a Cuban player under 25 years chooses to defect in the future, such a player could still sign with an MLB team but would be subject to a waiting period of one to two years. “This is designed to discourage smuggling. Smugglers want to be paid right way,” Halem said. Similar agreements with Nippon Professional Baseball, the Korea Baseball Organization, and the Chinese Professional Baseball League also have age restrictions, but MLB has reportedly been “wary of entering into an agreement that would seemingly trap young players” under an authoritarian government. The waiting period in the FCB agreement is reportedly designed to address that concern, by providing disincentive for defection but also making it possible for players who do defect to eventually make their way into their desired profession. Release fees that would go to FCB—between 15% and 20% of the total guaranteed value for Major League contracts, and 25% of the signing bonus for Minor League contracts, per the deal—will presumably help grease the skids for FCB Amateurs who seek permission to make the move to MLB ahead of meeting the service requirements for mandatory release. I guess we’ll see how that works. The whole thing is reportedly still subject to State Department approval. The Post reported that the State Department says it is “aware” of an agreement between MLB and FCB; the New York Times describes the necessary approval of the U.S. government as “far-from-certain.” This deal isn’t perfect, but it beats the hell out of Cuban teenagers being stashed on far flung islands by international criminal organizations and held for hundreds of thousands of dollars in ransom.